Fibralco a.e.b.e. produces a wide range of filter media. 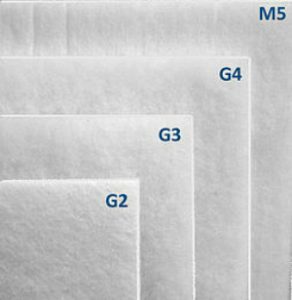 Being in the nonwoven industry more than 50 years, has the experience and the equipment to manufacture needlepunched, thermally bonded or combination, filter media under the ISO 9001:2008 quality control. Through the state of the art machinery and facilities the entire range of coarse dust filters G1, G2, G3, G4 as well as the fine dust filters M5, M6, F7, F8, F9 are produced, according to EN779 classification. The experienced personnel can adopt any new customer requirement to meet their needs. The company has initiated the procedures to obtain new tests according to the new ISO 16890 standard, which will replace the existing EN779 at the end of the year of 2016. The ISO 16890 will not take in consideration only the particle size of 0.4 microns but will determine separation efficiencies for particular matter fractions in a range between 0.3 and 10 microns.